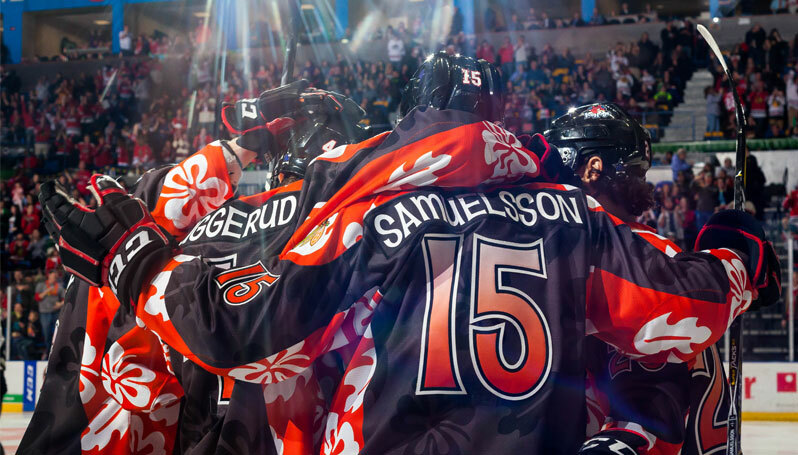 ROCKFORD, Ill. – The Rockford IceHogs announced they have raised a team-record $80,124 in funds from their annual Jersey Auction Game and Hawaiian Night on March 31. A portion of the proceeds from the event will benefit the Bryan & Amanda Bickell Foundation and the MS Society – Greater Illinois Chapter. The fundraiser finished as the largest-grossing jersey auction in IceHogs team history, surpassing the previous mark of $79,921 in 2015. The IceHogs have now raised more than $1 million for charity through 19 years of the annual Jersey Auction game. The 2017-18 Jersey Auction Night, sponsored by Insurance King, was held on Saturday, March 31 and featured tropical IceHogs jerseys, a luau with live beach music and hula dancers, a pig roast and a stencil pattern of Hawaiian hibiscus flowers painted throughout the ice. In addition, Stanley Cup champion and former IceHogs forward, Bryan Bickell, was on-hand to meet fans, sign autographs and help raise money for MS awareness. Bickell skated in 395 career NHL games with the Chicago Blackhawks and Carolina Hurricanes before announcing his retirement in 2017 due to a diagnosis of MS. The IceHogs also generated funds through meet-and-greet packages with Brian Bickell, Hamboni rides during intermission, loose donations and partnering with BMO Harris Bank to sell Hawaiian leis at the game. For more information on the IceHogs Charitable Foundation and IceHogs charitable initiatives, visit icehogs.com/community/charitablefoundation.